Fly Iberia to Europe for less than 13K in coach or 26K in business! Iberia Plus is celebrating their 25th anniversary by offering 25% discount on award redemptions booked by April 11, 2017. The promotion is valid on all classes of services on Iberia flights, and only for travel on off-peak dates through June 15, 2017, or between October 1 and December 15, 2017. Iberia flies nonstop between Madrid and five cities in the U.S, including Boston, Chicago O’hare, Los Angeles, Miami, and New York-JFK. Iberia has a distance-based award program. With the 25% discount, you can fly between JFK or Boston and Madrid for 12,750 Avios in coach, 19,125 Avios in premium economy, or 25,500 Avios in business class, plus taxes and fees. Iberia also does not impose fuel charges on its own flights! Below is the off-peak award chart for Iberia. Iberia Plus prices awards differently during peak and off-peak season. Dates in red below are peak dates and the rest are off-peak dates. Unfortunately the summer months from mid-June to early September are considered peak season and therefore not included in this promotion. However, both Thanksgiving week and Christmas holiday are included in off-peak season and therefore the 25% discount will apply! 1000 Membership Rewards points for 800 Iberia Avios. At 1:1 ratio from British Airways Avios to Iberia Plus, but only if both accounts have been open for at least 90 days, and both accounts have had some sort of activity. Iberia is a member of the Oneworld alliance. You can search Iberia awards on both British Airways website and Qantas website. 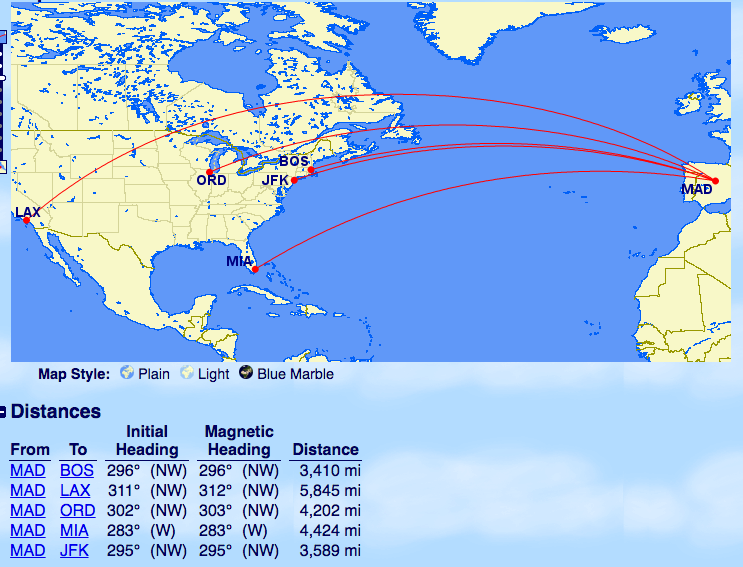 I looked up award seats over Christmas from New York to Madrid, and there are plenty of availability! Will you be booking Iberia awards to Europe for less than 13,000 Avios in economy or 26,000 Avios in business class? Remember you must book by April 11, 2017. In return, dp about a little discovery this morning, about that BA to Ibertia transfer rule, the one requiring “both accounts have had some sort of activity” — Well…. after over a year of searching for ways to be “active” — and failing various suggested tricks, this morning, the Iberia web site actually let me buy 2k Avios points directly…. and the posting was instant. This should now quality as “activity” — and from that happy point, I can rescue my long wasting away BA points. Great tip! On a separate note, I never waste my BA points 😉 They are great use for my inter-Asia trips. Could I transfer Chase points to British Airways and then to Iberia? That wouldn’t be instant would it? Yes you can transfer that way. Transfer from Chase to British Airways is instant. I am not sure about BA to Iberia. Oh is this round trip or one way?